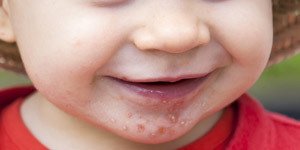 Hand, foot and mouth disease (HFMD) is a common childhood illness that is caused by a viral infection. The most common virus causing hand, foot and mouth disease is the Coxsackie A16 virus, but there are an increasing number of viruses associated with the condition. Some of these viruses can cause quite severe illness. HFMD typically affects children under the age of 10 years, but older children and adults can also be affected. In the majority of instances it's mild. There is no relationship between hand, foot and mouth disease and the condition known as foot-and-mouth disease that affects animals. The mouth sores, which start as small red spots and form painful blisters, often turn into ulcers. 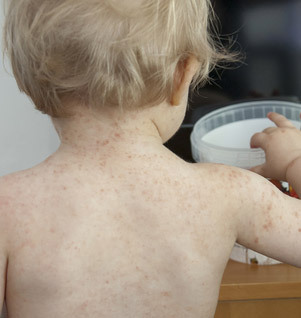 The disease spreads easily from person to person, often resulting in outbreaks in schools or child care centres. Outbreaks are most common in summer and early autumn. You can catch the virus from an infected person if you come into contact with their saliva, secretions from their nose or throat (through coughing or sneezing), fluid from blisters, or faeces. Is hand, foot and mouth disease a serious illness? HFMD is usually a mild disease, and children generally recover within 7-10 days. Rarely, a child with HFMD may develop complications such as meningitis (inflammation of the membrane surrounding the brain). If your child develops a stiff neck, headache or back pain then you should consult your doctor. There is no specific treatment for HFMD, and because the disease is caused by a virus, antibiotics are not effective. (Antibiotics can only be used to treat bacterial infections.) However, a simple pain reliever such as paracetamol is often all that is required to treat the symptoms. For adults, gargling or rinsing the mouth with salt water or an antiseptic mouthwash may help relieve the pain associated with mouth sores. You can help prevent the spread of the virus by washing your hands frequently, as well as washing and disinfecting contaminated items and surfaces. Try to make sure your child doesn't share items such as eating utensils, cups or towels while they are ill. Adults are rarely susceptible as they have often had the infection already as a child and are subsequently immune. There is no vaccine available. When can my child go back to school or child care? It's best if children with HFMD stay away from school or child care until all the blisters have dried. 1. Nassef C1, Ziemer C, Morrell DS. Hand-foot-and-mouth disease: a new look at a classic viral rash. Curr Opin Pediatr. 2015 Aug;27(4):486-91. doi: 10.1097/MOP.0000000000000246. 2. Ventarola D1, Bordone L2, Silverberg N3. Update on hand-foot-and-mouth disease. Clin Dermatol. 2015 May-Jun; 33(3): 340-6. doi: 10.1016/j.clindermatol.2014.12.011. Epub 2014 Dec 9.